For all materials needed we’ve included a list of quality products underneath. If your floor is missing some blocks, has damaged blocks – damages from plumbing comes to mind - or you notice areas where the blocks no longer stuck firmly down on the underfloor see our guide "7 Easy Steps to Repair/Restore your Parquet Floor". But 9 times out of 10 some extra TLC is the only thing needed and to be honest, sanding down an authentic 'old-fashion' design parquet removes much of its appealing character. Depending on how long the carpet has been down and how this was installed you will find more or less old carpet underlayment and carpet grippers sticking to your wooden floor. Some old fashioned 'elbow grease' has to be applied to remove most of this without damaging your valuable discovery. Carpet grippers should be remove with care by gently lifting the gripper out of the wood. Sticking a chisel under one end of the gripper and by careful wriggling it should come off without damaging your wooden floor. Or use a screwdriver to lift the staples out of the gripper first, that way when you have to use more force only the gripper itself takes the blunt of it. Tear of as much of the carpet underlayment as possible manually - consider it a labour of love. Don't use a damaged metal scraper to remove the last bits of foam, make sure if you use a sharp object that the edge is straight. Hard plastic scrapers might work better. As last resort use Mineral Spirit or lacquer thinner - but always read the instructions carefully before you use these chemicals, wear gloves and face-protection and make sure there is sufficient ventilation in the room! If you notice a dark, sticky substance on the floor, your original parquet floor has been treated with too much wax in the past. 'Wax-removers' from most brands only work on newly installed floors, not really on wax that has been covered over for years. In our experience using White Spirit still works best to remove these old layers. Again, when using chemicals always read the instructions carefully, wear gloves and face-protection and make sure the room is well ventilated. Or you could give it an intensive eco-friendly cleaning with Saicos Ecoline Magic Cleanser that soaks in the old wax and grime layers and is simply removed with non-fluffy cloths. After you removed the carpet you will notice a layer of dust and dirt, no matter how well or often the carpet has been vacuum cleaned. Either use a soft broom or decent vacuum cleaner (preferably a cylinder cleaner with brush nozzle; the wheels of an upright cleaner could scratch your floor when too much pressure is applied) to remove it. For reluctant dirt use a (clean) hard brush to shift it. After this rigorous treatment most dirt will have gone. To finish the cleaning part of the job use a natural detergent (cleaning soap, for instance Wash-care or even Magic Cleanser) diluted in water to remove the remaining dirt. Don't use washing-up liquid, that might be good for your hands but is not suitable for wooden floors! Wash the floor with a small quantity of water (well-wrung out cloth), use a scrubber if needed. For persistent dirt leave the solution on the floor for 5 minutes and then with a clean cloth remove it again. Rinse your cloth regularly with clean water and then wash the floor for a last time with cleaning soap as first described. Give the floor time to dry. Your floor is now clean, but will look dull and pretty sad. Depending on the finish type your newly discovered floor has - varnish/lacquer or wax/oil - you will need a suitable maintenance product. Power Wax or Wax-polish on a varnished floor will create a slippery surface. If you are not sure what type of finish is originally used you can try to determine this as follows: in an inconspicuous area, corner or behind a door, apply two drops of water. If, within ten minutes white spots appear under the drops of water, the floor has a wax/oil finish. (To remove the white spots, gently rub the spots with 000 steel wool dampened with wax.) If the finish does not flake from scratching with a coin and white spots do not appear from the drops of water, the floor has a surface (lacquered/varnished) finish. For a varnished/lacquered floor most maintenance product come in the form of a polish, for an oiled/waxed floor you have the choice between a polish or a hard wax (power wax). If your floor is really dull and looks rather tired it's best to apply power wax, a bit more hand-and-knee work but your floor will definitely love you for it. The brand new Saicos EcoLine wax-care spray is even easier to use, just spray a tiny little bit on the floor, spread out with a polish applicator, dry in 5 - 10 minutes. VOC-free and suitable for both oiled and lacquered floors! Hard wax (power wax): scoop some wax out of the tin and drop it on your floor. Spread and rub the wax out with a none-fluffy cloth, small areas at the time. Leave to dry out for 10 - 15 minutes. If your old floor looks really tired apply a second coat of the power wax in the same way. Buffing your floor after applying the maintenance product will give a better result. Most electric small buffing machines are too light for this work, they will hardly have any buffing effect on your wooden floor. Either use a semi-professional buffer with a large white pad or, which still works best, an 'old-fashion' buffing-block made of cast-iron (weights 7 kg!) - comes with our 100% guarantee. The movement of the pad or buffing block will warm the applied maintenance product, spreading it our even more evenly and allowing the wood to absorb it more. Plus it reduces the time your floor feels slippery. After every buffing stroke you will see your floor come back to live more and more until you've brought it back to its original and sparkling lustre. Specially an oiled/wax floor will start to show its natural beautiful character again. It's recommended to apply a maintenance product at least every 5 - 6 months, more often in heavy traffic areas, to keep your wooden floor protected against dirt and drips and to feed the wood for long term durability. You are now the pride owner of a valuable, durable, easy to clean and anti-allergic original parquet flooring. 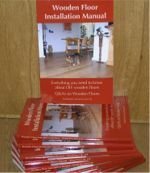 Remember, a newly installed parquet floor would have set you back £ 125.00 - £ 145.00 per sq m. With these 3 easy steps you do this labour of love for a lot less! Take good care of it now, it will reward you for years and years to come!